Of course there is more to do in town and you can find it all listed in the calendar section of the site. FEATURED BUSINESS OF THE WEEK La Choza - Located at 7402 Edinger Ave at Gothard. 714-842-7888. Traditional Mexican food since 1976 (but new to Huntington Beach). Make sure to try their home made tortillas. They are the best. They also have a great banquet room for your party needs! Perfect for those family gatherings or office parties! La Choza also now has a salsa night! Every Tuesday you can come out and do some dancing on their patio. Free lessons from 8:30 to 9:30 pm, and then practice your moves with dancing til 2:00 am! Yes there are a few places in OC that are open late! I haven't been to the salsa night yet, but I've heard they fill the place. I have eaten there, and I keep going back. It is SO good. Give them a try - their Mexican food is worth it. If you didn't see their coupon in the last copy of Dining Out in Huntington Beach, you can print it from your computer off our coupon page . Thanks to Joe Shaw for this posting in his 'Greetings from Huntington Beach' blog! I thought this was important enough to re-post it here! Let's support Huntington Beach. This Christmas it's more important than ever to shop locally. With reports showing a dismal October for retailers nationwide, with the Orange County housing market taking a more than 10 percent dive in the last year, and with the price of oil nearing $100 a barrel, all predictions are that consumers will be tight with this year's holiday spending. We can help our local businesses by keeping our holiday shopping dollars at home here in Huntington Beach. There are small specialty stores throughout our city that support families and Christmas is the time of the year when they make enough money to pay the bills for the whole year. Choose one of our small independent stores for your gifts this year. If you need to shop at chain stores, go to Bella Terra or Five Points or downtown Huntington Beach to do your shopping. Don't spend your money in Costa Mesa or Long Beach or Newport Beach. Let's help our local businesses and keep our money here at home. This is just terrible! So many of us locals are VERY unhappy. Once again the money of the big developers wins out and nature loses. Sad, so very sad. The Orange County Register story below barely begins to tell the awful tale of how Coastal Commission member Dan Secord and his merry band of development crazed panel members sought to gut their staff’s expert and scientific recommendations in order to allow Shea Homes to bulldoze and destroy wetlands and raptor habitat at the Bolsa Chica wetlands in Huntington Beach late last evening. It wasn’t as though coastal scientists and environmentalists sought to deny development. In fact, the preferred plan would have allowed even more than the 170 houses sought by Shea, but would have used a clustered approach to save wetlands on the property and insure endangered white tailed kite raptors survive the subdivision. Secord, notably, embarrassed himself and the intergrity of the entire California coastal program with his relentless efforts to destroy every bit of coastal resource protection conditions contained in the staff analysis. Secord even said, at one point, “Help me here, I want to delete the wetland.” Watch it for yourself as it is all on internet video available on the Coastal Commission website at www.coastal.ca.gov. (Note: Commission member Dan Secord is an appointment of Governor Arnold Schwarzenegger - three of four of the Governor’s panel members- Brooks Firestone, Bonnie Neely and Secord- read off the Shea Homes crib notes for their actions. Only gubernatorial appointment, Steve Blank, made an effort to protect wetlands and raptor habitat at the site. Worse, ALL FOUR of Assembly Speaker Fabian Nunez’ appoinments to the Commission- Ben Hueso, Patrick Kruer, William Burke and Dave Potter- towed Shea Homes’ freight. Sadly, only two of Senate leader Don Perata’s appointments- Sara Wan and Mary Shallenberger- sought to protect the wetlands, while the other two- Larry Clark and Mike Reilly- both sided with Shea. In the end, it was a great day for a growing corps of highly paid pro-development lobbyists and the ‘wine and dine’ atmosphere of the Commission and a sad commentary on the direction of the Commission, where coastal development and private profits trump even marginal resource protection efforts.Wednesday, November 14, 2007Homes next to wetlands OK’d by coastal panelShea Homes proponents and opponents are confused, however, as to exactly how much land both sides lost for their causes. Hotels for the Thanksgiving holiday visitors! Do you find yourself with last minute family members coming in to town? No place in your house to put them up? Why not let TheLocalHB.com help you out. Did you know you can make hotel reservations for HB and surrounding areas on the site? Pay the same, or most likely less, by making your reservation through our system. Safe & secure. Check out what's available HERE - and if you can't open that link, go to the HOTELS menu button on the site. And if you don't like making reservations on line, we also have a toll free number for you! 1-877-545-3249 where you can speak to a live person. And don't forget to check out the places in town who are offering Thanksgiving brunch/dinner. A couple of new ones have been added. INFO HERE . To start off the holidays right, do some celebrating and some shopping. A few events are coming up you'll want to know about. Thursday the 15th at 4:30, Happiness Consignment store (16562 Gothard @ Heil) is having a ribbon cutting. Ladies, you don't want to miss this one. This little shop if filled with treasures. Stop by that evening and show them your support. After that ribbon cutting, you can pop over to Ocean View High School (Warner & Gothard) for their Holiday Boutique . From 4 to 9 pm, it will take place in the school commons (enter off the Gothard parking lot). Put on by the Grad Night Committee, there will be 25 vendors to shop from including Cookie Lee Jewelry, Pampered Chef, Taste of Home, Longaberger, Arbonne , Partylite, Silpada, Gold Canyon, Holiday crafts and linens, Discovery Toys, Children's clothing and much more! There will be refreshments and opportunity drawings throughout the evening. On the following weekend - Friday the 23rd from 9am to 5pm and Saturday from 9am to 3 pm, Dinners Ready (7378 Center Ave @ Gothard) will host a Holiday Boutique. Stop by and check out the vendors and their wares! The new Fresh & Easy markets get a big thumbs-up from customers for product selection and lower prices. Maybe Fresh & Easy Neighborhood Market can compete after all. Parking lots were full and cash-register lines long at the six stores that British grocery giant Tesco opened in Southern California on Thursday. Some people showed up two hours before front doors were unlocked. To find out whether the wait was worth it, The Times sent staffers to four of the new markets and asked Evan Kleiman, host of "Good Food" on KCRW-FM (89.9) and owner-chef of Angeli Caffe in Los Angeles, and Donna Barasch, a Villa Park gastronome whose cookbook collection numbers more than 250, to visit two.They found Fresh & Easy to be a blend of Trader Joe's and Ralphs. "I would definitely go back," Kleiman said after returning home from the Fresh & Easy in Glassell Park. "We create value for our customers so they will come back again and again." "We treat people how we like to be treated and nobody tries harder for customers." "We think fresh, wholesome food should be accessible and affordable to everyone." "We're a neighborhood market, so it only makes sense that we care about our neighbors and our environment." "People who are valued are better able to value our customers, so creating a rewarding workplace is very important to us." People come up to me and ask me where I get my hair done.... I'm sure everyone has had that happen before. Well I hear that more than ever now. And it is because I switched over to Salon Ambiance (5075 Warner Ave near Bolsa Chica - 714.846.5900). They have been open a bit over a year now and that is about how long I've been going there. And not once have I been disappointed. In fact, it is the opposite. I love them! Sopi, the owner, is the one who takes care of me. If you give them a call and she isn't available, I can also recommend Paul Pina - I know others who go to him and are very happy!! If you are looking for a new place to get your hair done, check them out! They are, of course, full service so anything you need done they'll do! And make sure to check the website for other business listings! Huntington Beach is once again preparing for its Fourth of July event celebrating the American Spirit. 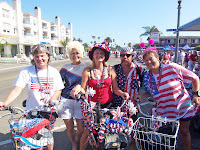 The City of Huntington Beach celebrates 103 years of patriotism in 2007 with the Huntington Beach 4th of July Parade and Celebration. 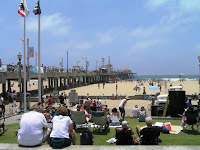 The 2007 festivities offer four full days of entertainment starting July 1st with a huge 4day Family Fun Expo at the famed Huntington Beach Pier. The celebrations include a Main Street home decorating contest, the July 4th Pancake Breakfast at Lake Park, the Surf City 5K Run and FExpo, and the famed 4th of July Parade oMain Street. On the evening of July 4th, a spectacular Fireworks Extravaganza at the Huntington Beach Pier will put a fitting final bang on the celebration. Be sure to bring your entire family out for this event and start a tradition of your own. Parade Marching bands, military troops, community groups, dignitaries, clowns, equestrians and celebrities make up more than 300 parade entries that will thrill parade goers until just past noon. The103rd Annual Huntington Beach Parade begins at 10 am sharp with hundreds of entries and attractions along the Historic Main Street Parade Route. The parade heads south to Main Street, proceeds up Main through the downtown area, ending at Yorktown Avenue and Main Street. Celebration sponsor, Time Warner Cable television, will be on hand again to tape the Parade for re-broadcast over KOCE later in the day at 3:30 in the afternoon. The 2007 Celebrity Grand Marshal will be Johnny Grant. As Hollywood’s Honorary Mayor, he has been one of the community’s most enthusiastic supporters for more than 50 years. He also serves as Chairman of the Walk of Fame Selection Committee and the Hollywood Historic Trust. Pier Plaza Fun Expo & Entertainment - Entertainment will be at Pier Plaza every day of the Expo – Surf Bands, Dancers, Swing Bands, Singers from 12:00 to 9:00 PM. See HBTV Scroll for names and times. It entertain the family with kids’ entertainment, crafts and other delicious treats. The Expo will run 10 am to 9 pm on July 1, 2, and 3. On the day of the parade, the activities will run from 12:30 pm to 8 pm, with entertainment starting at 1 pm. The 4th of July activities will feature live music and a "Children’s Village Expo" on the first three blocks of Main Street from 1 pm to 7 pm. The Expo is located at Pier Plaza at Main Street and Pacific Coast Highway. The Kiwanis Club of Huntington Beach will be hosting a Pancake Breakfast at Lake Park from 7 am to 10 am. Tickets are $5 and will benefit the many important community projects of The Kiwanis Club of Huntington Beach. The breakfast is located at Lake Park, at Main and 11th Street. High School. The registration costs for the Surf City Run 5K are $25 before June 17 and $30 after June 17. The Surf City Run benefits the Huntington Beach Jr. Lifeguard program. The Surf City Run Fitness Expo will be open from 6 am to noon fthe enjoyment of runners and their families in Worth Park at 17thand Main Street. Participants can enjoy a variety of food and refreshments, entertainment and music, and view some of the latest in health and fitness. Entertainment will be provided by local surf band favorite, The Breakaways. For more information on the run or to register online, visit www.surfcityrun.com . Everyone is a winner in the popular Thomas Kemper Soda Kids Run. Held after the Surf City Run 5K, kids 6 and under will run. The kids’ races are not timed and all kids receive an official race t-shirt, goodie bag and finish medal. The race begins promptly at 9 am at Huntington Beach High School and will last until 10 am. Registration costs for the event are $13 before June 17 and $17 after June 17. After the sun sets, grab a seat on the beach for the spectacular fireworks display over the beach. Thousands of fireworks, synchronized to patriotic music will be launched from the pier. K-Earth 101 continues celebrating 35 years of playing "The Greatest Hits on Earth" with live radio from the Pier and will simulcast the fireworks’ musical accompaniment. The show will begin at 9 pm and end by 9:30 pm. Seating on the Pier can be purchased at a cost of $10. Tickets are available on the 4th of July website at www.hb4thofjuly.org or at the Pier on the July 4th. Or call Kim at 714-536-5486 for more information. 4th of July information provided by the city's Community Connection. A studio got City Council's permission to do a reality series about Surf City lifeguards for Court TV. You may not see bodacious babes in red bathing suits bounding down the city's shoreline in super slow motion any time soon. Those "Baywatch" images wouldn't be part of a 10-part series called "Beach Patrol," to be aired on the Court TV cable channel after the City Council gave its blessing to the production Monday night. "Beach Patrol," a reality show along the lines of Fox Network's "Cops," would stick to what lifeguards do on the job rather than their off-duty antics or personal relationships, said Huntington Beach Marine Safety Lt. Michael Baumgartner. The show will be filmed over the summer. A production crew from Burbank-based Evolution Film and Tape will follow lifeguards seven days a week, capturing their every move on the job, from ocean rescues and medical aids to jelly-fish bites and their interactions with beach-goers, Baumgartner said. "We look at it as an opportunity to showcase what we do as lifeguards and create awareness about beach safety," he said. Evolution Film and Tape also produces the popular reality show, "The Real Housewives of Orange County." City Council members gave city officials the authority to control what goes on film and to take out "embarrassing or unprofessional" portions, if necessary. The studio is also offering the city an $8,000 donation per episode to be used for marine safety programs. Susan Ievoli, a senior publicist for Court TV, declined to talk about the Huntington Beach production because it is "still being developed." "Beach Patrol," which airs in prime time, begins its fourth season July 16 with episodes of lifeguards in Honolulu, Ievoli said. Huntington Beach would potentially be featured for its fifth season. The show consciously steers clear of the type of sensationalism associated with lifeguards, and instead, focuses on their daily heroics and behind-the-scenes action from daring rescues to brawls on the beach, Ievoli said. "Their everyday lives are so dramatic," she said. "We don't feel the need to add more sensationalism to it. We just want to show their importance and heroism." If the show moves forward, it would be the first time Huntington Beach lifeguards were featured on a series-type cable show. While visiting the site, make sure to check out the calendar for things going on in town. You can also find things to do, shopping & specials, and even buy logo merchandise for locals! See you around Huntington Beach! going on here!” was the personal quandary that began Victoria Alberty’s newest online business. Alberty talked to a lot of HB Locals and that hurdle seemed to be a common cry throughout the beautiful community of Huntington Beach. Sure, the ‘Independent’ gives us a plethora of information, and there’s always the ‘View’ and ‘The Wave’, but these days, so many people are used to surfing the ‘Net to get their information instead of actually sitting down with a cup of coffee and holding a print publication in their hands. Of course, they can turn to the HB City or Chamber sites, but there wasn’t an online site that was a ‘one-stop-shopping’ for information, discounts, reviews, and ‘local’ happenings. So Alberty got busy. She began by using a photo taken by a friend took as the basis of her logo. Then she bought the domain name: ‘www.thelocalhb.com’ and began to envision her design ‘plan’ for her website. Only a few close friends were privy to her initial plans and they supported (and encouraged!) her 100%. Of course, all of them were filled with ideas! “The Local HB” began as a source of information and has turned into her full-time quest, as well as being a favorite desktop icon on numerous computers. “The Local HB” is totally unconventional. It doesn’t follow a format – it just ‘is’. 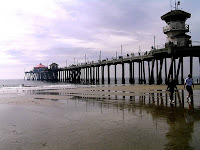 A hodge-podge of information, it somehow all comes together to give you a total overview of beautiful Huntington Beach. The photos on the site are a combination of events and locations that Alberty takes as well as those contributed by friends and visitors. Alberty attends everything and anything sponsored for and by Huntington Beach and is frequently found chatting with locals, always looking for content to add to the site. Readers contribute their opinions about local restaurants; submit photos of events they attended and even short digital videos. Businesses are jumping on ‘The Local HB’ bandwagon and advertising on her site, offering a variety of discounts. Several HB hotels distribute her flyer in their rooms so guests can log on to find out what’s happening on the days they’re visiting. Alberty’s friends tout her site and these days, you’ll see a lot of ‘The Local HB’ t-shirts and memorabilia floating around. Her shopping cart is just another of her great additions. ‘The Local HB’ isn’t just a run-of-the-mill website. It IS what HB is all about… Friendly, upbeat, informative and exciting. When you live in Huntington Beach, why should you go anywhere else to add to your day? It’s all right here… Just ask Victoria Alberty! Now it’s your turn. Go to www.thelocalhb.com and surf through Alberty’s site, and while you’re at it, add a shortcut to your desktop. Don’t forget to share the site with your in-and out-of-town friends, too. Send in your opinions, experiences, pictures, short videos and if you have a business, you just might want to take advantage of the advertising opportunities! Get involved with ‘the Local HB’ and become a part of the best thing to hit Huntington Beach since Jan & Dean! Our very own HB dance studio, A Global Rhythm, will host a dance competition for the YMCA Youth Achievers in our neighboring town of Costa Mesa at the Presbyterian Church of the Covenant. See Flyer for more information. Fish without a license today in Huntington Beach. Bag and size limits still apply. see dates below Summer performances at The International Surfing Museum (parking lot), 411 Olive (@ 5th). Free!For more information: www.surfingmuseum.org June 10 - SoundWaves - special guest Eddie Bertrand from Eddie and the Showmen who is well known for the songs 'Squad Car' and 'Mr. Rebel'.